Successfully Added Single DIN Car Multimedia Center with DVD + Touch Screen to your Shopping Cart. Single DIN Car Multimedia Center with DVD + Touch Screen. New 1-DIN sized (50mm tall) car entertainment system that mergers all of today's media devices in to one single controlled unit. 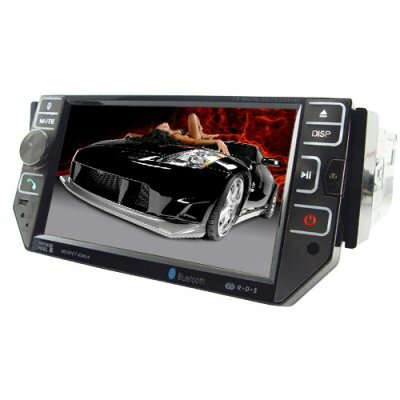 This single DIN car media system comes with a 5.8 inch LCD touch screen detachable face plate, along with several multimedia slots and ports to support most of today’s portable media players. The CVSA-444 brings technology to life with its compilation of various compatible features to support a variety of functions, such as rear view camera, iPod/iPhone, MP3/MP4 players, DVD/CD discs and SD/MMC cards. In addition, your vehicle sound system will improve tenfold with this car multimedia system. This multimedia car player with its bundled features and functions is specifically designed for every imaginable scenario, in order to provide maximum enjoyment for drivers and their passengers. Wait, there's more! Also built with motorized screen open/close function, and a fully interactive Bluetooth connection manager for both making and receiving calls through your car's stereo system. And If you think that's not enough to keep you busy, then you can also watch analog TV and listen to the radio with this single DIN fully interactive car media system. A great wholesale price makes this Car Multimedia Center perfect either for the resale market, OEM market, or personal/company use. As always, it is available direct to you from the leader in direct wholesale electronics, Chinavasion. i connect an electronic antenna for the analog tv and the result is perfect,i receive all available tv stations in bright clear icon,the resolution of this screen is amazing beating a lot of the large lcd screens,i connect this unit at my car(honda prelude)with two tweeters,two front 150w and two rear180w clarion speakers plus a boxing 12inch subwoofer clarion with its amplifier ..i was afraid that this car dvd unit will not support my sound system but i was suprised by the result..not only support em and producting a really super clear bass sound i used only the 3/4 of the radio volume 30/40 as the sound are really powerfull and i have the bass control at +1 and can go up to +6 and i can`t put it in full volume as the sound are really in freaking power...the fm searching of this radio is ounstanding as i receive more stations than ever and the usb fuction allow me to watch and listen my favourites you tube video clips in a super screen quality...i order many times from chinavasion and i always be satisfield with quality but this one is my best buying ever..DON`T MISS THIS BABE!!! the screen it looks amazing big,the menu function is very easy to use it,the DVD player is also amazing make the car a real cinema room,the bluetooth operating perfectly just choose the bluetooth icon from menu pair it with your cell and thats it,you not need ansewr or call by your cell unit,do it by your radio screen..thanks and really impresing piece!! !